The poetic geometry of Adrian Heath’s abstract vision is beautifully presented here in the dramatic arrangement of interlocking grey, black and yellow planes, articulated with vivid orange like molten rock. The carefully developed structure consists of tightly-packed, fragmented forms which amass and pivot around the low centre of this large canvas, unfurling across a dense and dynamic surface. The spontaneity of the paints application and its varied texture generates a vibrancy propelling the movement of forms and rivalling the vitality of the painting’s palette. This striking work was previously in the collection of Heath’s friend and patron, the British magazine publisher, Sir Edward Hulton (1906-1988), credited with leading the development of photojournalism as proprietor of the pioneering weekly publication Picture Post. Not seen in public for nearly sixty years, this sumptuous and dynamic Post-War masterpiece demonstrates a new freedom and sensuality in Heath’s painting, which led Neville Wallis in The Times to describe him as ‘one of two or three British painters able to hold their own with de Staël or Poliakoff.’ The importance of Heath’s work of this period is documented by its purchase at the time by public, as well as illustrious private collections, including the Calouste Gulbenkian Foundation, the Tate and the Arts Council, whose Composition black and grey is a smaller variation of Heath’s Composition black, grey and yellow. The artist, theorist, curator and teacher, Adrian Lewis Ross Heath was born in Maymo, Burma on 23 June 1920, returning to England at the age of five to live with his maternal grandmother in Hampshire. He attended Bryanston School in Dorset from 1933-37 before becoming a private pupil at the Newlyn School of Art under Stanhope Forbes in 1939. His subsequent education at the Slade School of Art from 1939-40 (evacuated to Oxford) was interrupted by the Second World War, during which Heath served in the RAF. He was shot down in November 1941 and was taken prisoner in Germany from 1942-5. Heath met and encouraged Terry Frost to paint in a POW camp, Stalag 383, Bavaria. At the end of the War, Heath finished his training at the Slade between 1945-7, before spending a year painting in France. He returned to the UK in 1948 and became friends with Victor Pasmore, Kenneth and Mary Martin and Anthony Hill. Pasmore encouraged Heath to exhibit his first abstract composition at the London Group in December 1949, following which he became a leading figure in the British Constructivist Movement in the 1950s. He wrote and published Abstract Painting: Its Origin and Meaning at the same time as his first one-man exhibition at the Redfern Gallery in 1953. Heath commissioned and was included in Lawrence Alloway’s seminal, Nine Abstract Artists and took part in the renowned This is Tomorrow exhibition at the Whitechapel Art Gallery in 1956. He taught at the Bath Academy of Art, Corsham from 1955-76, his colleagues including Peter Lanyon and William Scott. He was artist in Residence at Sussex University in 1969. 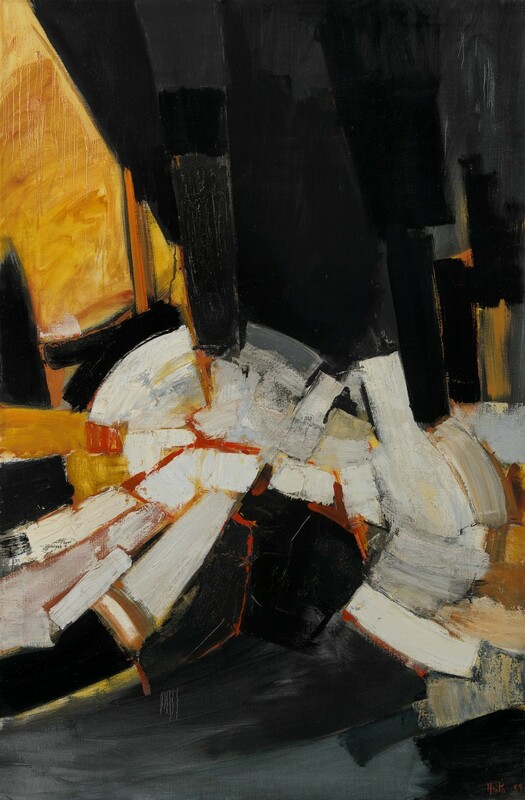 Heath became chairman of the AIA (Artists’ International Association) from 1954-64 and helped organise the first Post-War exhibition of abstract art at the AIA in 1951. He served on the Arts Council’s advisory panel from 1964-67. The work of Adrian Heath is represented in the collections of the National Galleries of Scotland, Tate London and the Hirshorn Museum, Washington DC, amongst others. Cited in Jane Rye, Adrian Heath, Lund Humphries, Farnham, 2012, p.142.